Kathleen Sommers is a wonderful designer who has been supporting the arts for years in San Antonio, Texas. She is the owner of a beautiful shop "Kathleen Sommers" in San Antonio, and I was fortunate to meet her at the beginning of my career as an artist. She was my first client and helped me a lot, I count her as a good friend and a wonderful mentor. I will always be thankful for her help and support. When Kathleen asked me to be part of her first Bracelet Show last year, I was honer to be part of that wonderful show. A percentage of the sales was going to go for the scholarship fund at Southwest School of Art. I was happy to support the arts and my school too. This year the second Bracelet Show opening night will take place on December 9th from 5 to 8 pm at Kathleen Sommers, located at 2417 N. Main. The Second Annual Collective Show has over 60 designs from 35 artists. 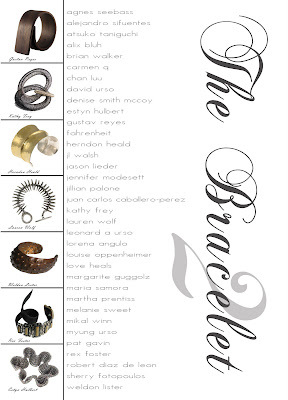 Bracelets will be on display and available for purchase at Kathleen Sommers through December 18th. Portions of the sales will go to the scholarship fund at Southwest School of Art. This is the bracelet I made for this wonderful event. Please come and support this fantastic event, and at the same time give back to the community by giving someone the opportunity the enrich their lives with a scholarship from Southwest School of Art. Remember, portions of the sales will go to the scholarship fund. Sounds like a great show and I really love your bracelet! I wish I could be there! wish i were local (we're in portland OR). your work is lovely and meaningful. Very interesting and I have now become a follower. Hopefully you will get a lot out of mine also.